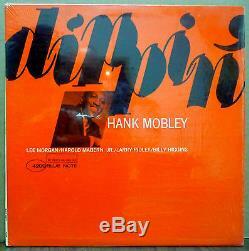 HANK MOBLEY "Dippin'" ORIGINAL BLUE NOTE LP HAS THE NEW YORK USA LABEL ADDRESS (MONO 4209). THE GLOSSY VINYL HAS THE VAN GELDER STAMP IN THE DEAD WAX. THE VINYL IS IN NEAR MINT CONDITION WITH CLEAN LABELS, PLAYS GREAT. THE GLOSSY COVER, STILL IN THE SHRINK WRAP, IS IN EX CONDITION WITH NO WRITING OR SEAM SPLITTING, DOES HAVE A SMALL CORNER BUMP. INCLUDES THE BLUE NOTE INNER SLEEVE. PLAYERS INCLUDE: LEE MORGAN, BILLY HIGGINS, HAROLD MABERN & LARRY RIDLEY. CLEANED ON A VPI RECORD CLEANER. STORED IN AN AUDIOPHILE INNER SLEEVE. 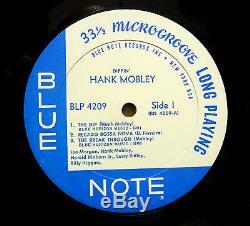 ORIGINAL BLUE NOTE MONO RARITY. 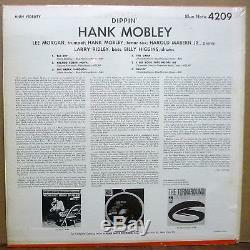 The item "HANK MOBLEY Dippin' ORIGINAL BLUE NOTE Mono LP 4209 NY MINT-! In Shrink" is in sale since Sunday, March 06, 2016. This item is in the category "Music\Records". The seller is "atomic_records" and is located in Burbank, California. This item can be shipped worldwide.